ISS might be destroyed soon, de-orbiting for a controlled reentry into the Pacific Ocean. Why isn't simply pushed away from Earth to an outer stable orbit (not sure if it's possible) or even into an interstellar space voyage? Maybe it has not any scientific value (specific probes are better and specifically designed for this task) but at least they will not destroy that amazing technological achievement and it may still contribute to research during its sunset (specific instruments may even be carried on board). I don't think it will use more propellant than a controlled re-entry. The ISS is not designed to be run unmanned, entirely. The staff on board, when there are 6 astronauts, between exercise, sleeping, and maintenance get a single person-day of science work completed. (That is an 8 hour days' worth). What would happen if we stopped maintaining the ISS? Try to keep it flying: due to structural and other stress, you would need to replace parts of the ISS. You might end up with a situation like Mir where more time is spent patching the station than actually making use of it and waste a lot of money and time. Just abandon the ISS: Not a good idea, its orbit decays and the ISS would thus fall back to earth uncontrolled. Parts may hit inhabited areas. Maybe even large areas. Increase its orbit a bit so it won't hit earth in the next few years: just a temporary solution that only wastes money and creates headaches. 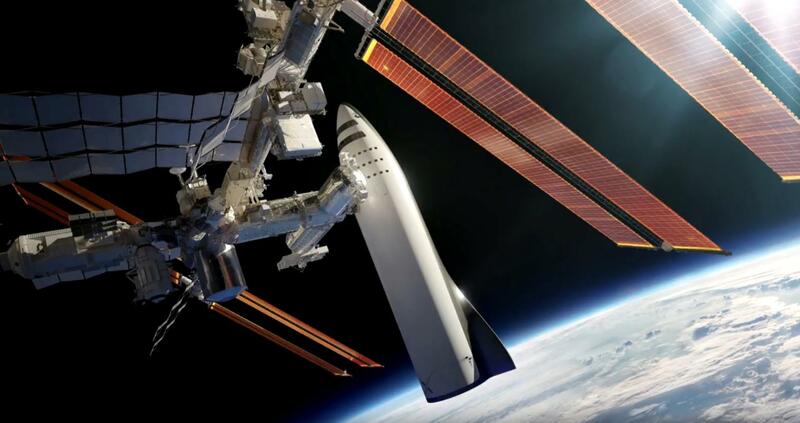 Push the ISS far out (leave earth orbit): a very expensive option, it would require a lot of fuel to push that much mass into interstellar space. AFAIK no currently available solution would be available. The on-board tanks can only hold enough fuel for a measly ∆v of 50m/s, but a ∆v of about 3220m/s is required to reach earth escape velocity from LEO. You would need to develop and build a solution for that and fly a lot of missions. Make the ISS take a controlled dive into the atmosphere where it burns up: Since it's very costly to keep it up, it must come down. With this option, you get to control where and when it comes down and "only" requires to develop and build a modified Progress. The problem with the ISS is that it cannot simply be left in its current orbit, because there is a (miniscule) amount of atmospheric drag acting on the structure to continually slow it down. Since the first module was placed in orbit, we've had to periodically boost the ISS back up to its nominal orbit (e.g. using the space shuttle's RCS engines while it was docked, or the station's main engines on the Zvezda module) to compensate for the effects of drag. There are additional forces which perturb the orbit (irregular density of the Earth, solar wind, variations in atmospheric density and composition, etc.) but drag is by far the biggest factor. If left alone, this drag force will eventually slow the ISS so much that it falls from orbit on its own, and we won't be able to control when and where that occurs. Something that massive falling from orbit poses a safety hazard, so by intentionally de-orbiting the station at a time and place of our choosing, we can control where it falls so that nobody is put at risk. The station is huge, but actually very delicate. Things like radio antennas and solar arrays would have to be stowed or removed, otherwise they could exacerbate the effects of getting hit by small debris. The solar arrays in particular can also contribute to undesirable rotation of the station (due to gravitational gradient and solar wind effects) which could ultimately damage the station. Without solar arrays, there is no power, and without power, there is no attitude control, monitoring or communications, and most importantly, no thermal control. The station would have to rely entirely on passive heating and cooling, which aren't the most stable things in orbit. Finally, the station contains a lot of volatile materials such as coolant liquids, water, air, thruster gases, etc. Most of these would have to be vented from the station beforehand, because any leakage later on could act like a small thruster, causing the station to rotate or change orbit in an undesired way. Batteries and fuel cells would have to be removed or fully discharged to avoid undesirable (and potentially explosive) chemical reactions in the uncontrolled environment aboard the station. Now to the second point: getting the thing out of the way. You actually don't have to go to interstellar space to preserve the station, as some other answerers have suggested; the Moon has been in stable orbit for millions of years and will happily remain so for millions to come. The question is: how far do you have to go to avoid bothering other satellites and rockets? The answer is a graveyard orbit, an orbit a few hundred to a few thousand kilometers above geostationary where old satellites go to die. Objects placed in such an orbit can theoretically stay there forever. This is the bugaboo: because the ISS weighs a staggering 420 metric tons, it would require an enormous amount of propellant to move that bulk from 400km to 37,000km! (Think Saturn-V levels of propellant.) Nobody wants to pay for the rocket(s) and fuel to do that, or all of the preparatory work for Bullet 1 above. So while I and many others would agree that we should preserve the ISS as a matter of World Heritage, unfortunately the cost to do so would be, quite literally, astronomical. Thermal cycling abuse- It seems likely this won't be an issue from studies so far. Solar panels- By the year 2028, the solar panels will have degraded about 30%. This might be an issue, and is the most likely item to cause problems. Electronics are out of date- Might need some fairly major updates. But this could be avoided if required. Cost- The ISS costs NASA bout $3.5 billion to maintain per year. That money could go elsewhere that might be more productive. The bottom line is, I expect that the ISS will continue to be in use for as long as it makes sense to keep it operating. It cost a large amount of money to get it up there, and I expect until the station could be replaced, it will remain up there. Of course, this could all be moot. If SpaceX managed to get the BFR working, it will essentially be the size of the space station. That would reduce the operating cost of the ISS somewhat, but it would also make it redundant. There are other companies talking about building their own space stations as well. Mars will likely be a major target then. Not the answer you're looking for? Browse other questions tagged iss deorbit or ask your own question. How can I, a high school student in Bucharest, go on to become an ISS astronaut? Why is NASA planning to deorbit the ISS instead of reusing its newer modules, like the Russians will? How feasible would it be to move the ISS to the surface of the Moon to recycle its components in future? What would happen to the ISS if we stopped maintaining it? What is the likely plan to deorbit the ISS given its size and shape? Has the answer to PopSci's question “How Many Years Does The Space Station Have Left?” been published? Why does the ISS track appear to be sinusoidal? Why does not the ISS turn when accelerating?